Gothenburg, Sweden’s METAL MONARCHS – a tribute to heavy metal featuring members of HAMMERFALL, DREAMLAND and DRAGONLAND – will reunite for a run of shows in 2013. Formed in the fall of 2003 by Oscar Dronjak (Hammerfall) and Mats Rendlert (Dreamland), with Jesse Lindskog (Dragonland) and Eric Rauti (Dreamland) joining shortly thereafter. Dan Cardesjö (THE BREEDING) was enlisted on vocals, and this five-some performed numerous times together throughout 2004. Dan was replaced by Jonas Heidgert (Dragonland) in the beginning of 2006, expanding the number of songs the guys could execute extensively with his wide vocal range. The object was – and still very much is – to play songs they love from their favourite bands, trying to come as close to the original as possible. That includes the little nuances in tone in guitar solos, drum fills, the wailing on the vocals etc. Being the die-hard heavy metal fans they are, having enjoyed listening to the songs thousands of times collectively, this is very important. And that is where the tribute aspect comes in. The name Metal Monarchs is a play off of MANOWAR’s Kings Of Metal, but instead of referring to themselves, it’s the songs being performed that the monicker is aimed at. An edited version of the song “The Black Mare” from Swedish power metallers DRAGONLAND can be streamed HERE. The track comes off the band’s new album, “Under The Grey Banner”, which will be released on November 18 via AFM Records. The third part of the “Dragonland Chronicles” trilogy features musical actor Fred Johanson in the role of the antagonist, with all three singers from AMARANTHE — Elize Ryd, Jake E and Andy Solveström — also making appearances. DRAGONLAND‘s fifth album was recorded at several different studios, with Jacob Hansen adding his magic touch to the mix at Hansen studios in Ribe, Denmark. Twelve songs were recorded during the sessions, and the music itself is based on a deep and emotional story, picking up where the band’s second album, “Holy War”, left off nine years ago. “Fire And Brimstone” is available for streaming in the YouTube clip below. The visual artist from million-selling PC game “The Witcher”, Damian Bajowski, will provide artwork for the album; not only will he be responsible for the cover, but will also make illustrations for the various locations in the saga. Commented guitarist Olof Mörck: “To say I am excited about this album is a grave understatement! “We were more than thrilled when both Damian Bajwoski and Fred Johanson accepted to contribute to this album. To have the album fully illustrated with majestic scenes and vistas from the story, and to have such a powerful and convincing voice in the role of the antagonist will lend a lot of credibility and depth to the final project! Our singer friends from AMARANTHE also appear in minor roles, further developing the universe the story is set in. “Under The Grey Banner”, the new album from Swedish power metallers DRAGONLAND, will be released on November 18 via AFM Records. The third part of the “Dragonland Chronicles” trilogy features musical actor Fred Johanson in the role of the antagonist, with all three singers from AMARANTHE — Elize Ryd, Jake E and Andy Solveström — also making appearances. A video feature describing the Royal City of Westmar, which appears on “Under The Grey Banner”, can be seen below. 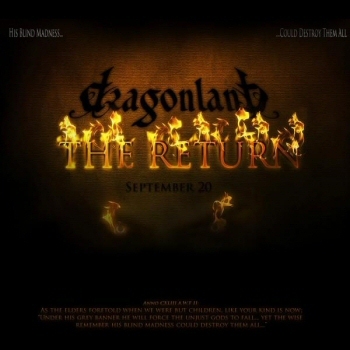 DRAGONLAND recently parted ways with guitarist Nicklas Magnusson and bassist Christer Pedersen. Taking over bass duties is Anders Hammer (NIGHTRAGE) and sitting behind the drums is Morten Lowe Sorensen (THE ARCANE ORDER, SUBMISSION, AMARANTHE). Previous drummer Jesse Lindskog will handle second-guitar duties in the future. 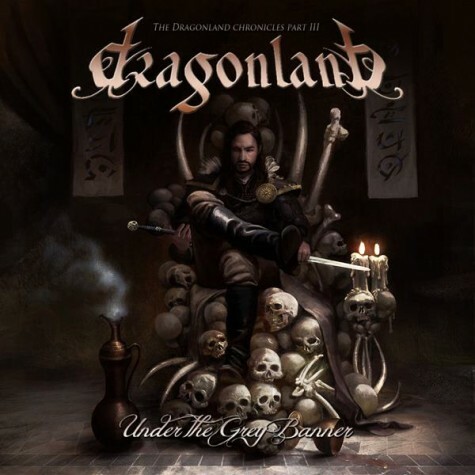 The cover artwork for “Under The Grey Banner”, the new album from Swedish power metallers DRAGONLAND, can be seen below. Due on November 18 via AFM Records, the third part of the “Dragonland Chronicles” trilogy features musical actor Fred Johanson in the role of the antagonist, with all three singers from AMARANTHE — Elize Ryd, Jake E and Andy Solveström — also making appearances. DRAGONLAND‘s fourth album, “Astronomy”, was released in November 2006 via Century Media Records. “Fire And Brimstone”, a brand new song from Swedish power metallers DRAGONLAND, can be streamed in the YouTube clip below. The track comes off the band’s new album, “Under The Grey Banner”, which will be released on November 18 via AFM Records. The third part of the “Dragonland Chronicles” trilogy features musical actor Fred Johanson in the role of the antagonist, with all three singers from AMARANTHE — Elize Ryd, Jake E and Andy Solveström — also making appearances. Swedish power metallers DRAGONLAND have set “Under The Grey Banner” as the title of their new album. The third part of the “Dragonland Chronicles” trilogy will be released on November 18 via AFM Records. Musical actor Fred Johanson will play the role of the antagonist, with all three singers from AMARANTHE — Elize Ryd, Jake E and Andy Solveström — also set to make appearances. DRAGONLAND‘s fifth album was recorded at several different studios, with Jacob Hansen adding his magic touch to the mix at Hansen studios in Ribe, Denmark. Twelve songs were recorded during the sessions, and the music itself is based on a deep and emotional story, picking up where the band’s second album, “Holy War”, left off nine years ago. The effort also includes a guest appearance by the legendary musical stage actor Fred Johanson. Songtitles set to appear on the new album include “The Tempest”, “A Stranger I Know”, “The Shadow Of The Mithril Mountains” and “A Thousand Towers White”.